4 CDs. 4:49 hrs. Listening Library. Apr. 2018. $45. ISBN 9780525588580. digital download. Gr 9 Up—Before email, text, and direct messaging, there was the good, old-fashioned folded note passed from one student to another in the halls, through lockers, or during the middle of class. 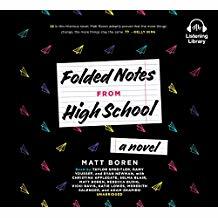 First-time author Boren tells the story of South High School senior Tara Maureen Murphy solely through the notes she writes and receives during the early 1990s. This is a full-cast presentation with each note writer having their own narrator—a plus for the listener to keep track of characters in this unique take on the epistolary novel. Unfortunately, this is the only bright spot. As the letters themselves begin to blend together, the characters lose their realism and relatability and morph into one-dimensional caricatures. There's the shallow cheerleader, her put-upon best friend, the misunderstood popular girl, the egomaniacal jock, and the sweetly naive freshman. This listen becomes tedious after only the first hour, especially with Tara, whose whiney voice and vanity never allow for her to be sympathetic or fully realized. The nostalgia of the '90s is used mostly as an accessory and does not enhance the plot. VERDICT Teens looking for realistic high school stories set in past decades would be better served looking to classics by Judy Blume, Walter Dean Myers, and Paula Danziger.